This July I finally had the opportunity to travel to China, and to experience a country which I have read much about but never previously visited. The stay was somewhat short - I only had two and a half weeks - and hectic - it included visits to five different cities, - which meant I only got to witness a small fraction of a fraction of the great equation that is China. But I did manage to fulfill one of the goals I set out with: a visit to the world's last remaining Manichaean temple. It lies nested in a hillside at the outskirts of Quanzhou, a city long known in the west as Zaiton and one of the most important ports of China, eulogized by among others Marco Polo. The temple was built in the 13th or 14th century when China was ruled by Kublai Khan's Mongol dynasty (the Yuan) and thus about contemporaneously with Polo's stay. It seems in fact clear from his narration that Polo met with Manichaeans in Quanzhou, perhaps the very same who made use of the temple. Before I describe my own visit to the site, which will be published in part II of this post (now available here) , I want to give an account of the Manichaeans of China, a largely forgotten chapter in the history of religions - so much so that even specialists long doubted claims of their existence. Finds in the early 20th century from western China, and subsequent research on other Chinese sources, decided the issue. It has revealed a Manichaean presence here that lasted at least a thousand years, and one that included a flourishing indigenous Chinese Manichaean community. 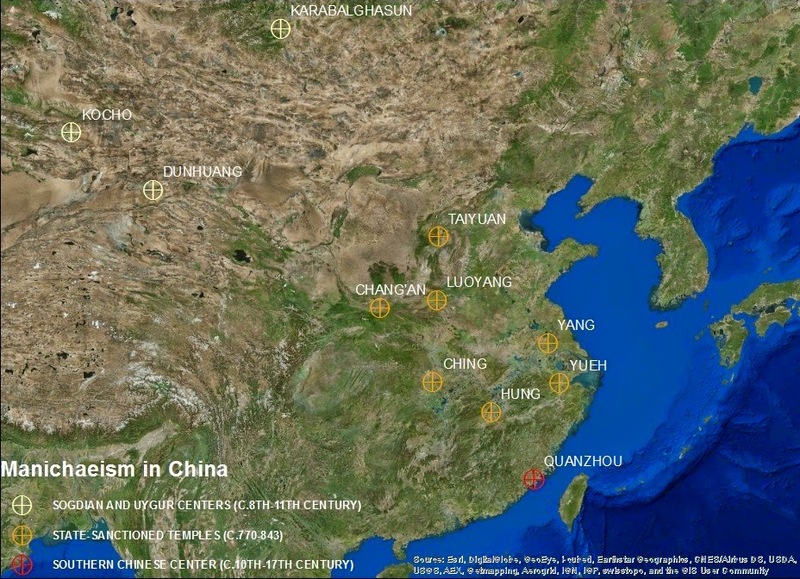 Recent evidence point to the existance of Manichaeans among the Western traders in China already in the 6th century CE. These communites consisted of Sogdians, a people who controlled much of the trade between China and the Sasanid or Persian Empire, many of whom had been converted to Manichaeism by the early missionary work of Mani's apostles (see a previous blogpost). The first chronicled presence is that of a mu-che (a Manichaean Teacher, one of their most important clergy officials) that preached in China during the mid-7th century, although little more is known of his activity. The first official - that is, court-registered - preacher was a diciple of this mu-che, a man named Mihr Ormuzd and designated as fú-to-tàn ("Attendant of the Law"; a Manichaean bishop), who visited empress Wu in 697 CE bringing with him a book named "The book of the two Principles". Twenty years later, in 719, the king of Tokharistan (present-day northern Afghanistan and Tajikistan) recommended a great mu-che and astrologist to the Chinese court, and he seems to have been the first to ask for permission to build a Manichaean temple in the country. Their welcome was however a chilly one. Chinese government officials were constantly wary of the new religion, which also had to contend with hostile reactions from certain Buddhist authorities. In 732 an imperial decree warned: "The doctrine of Mòní is entirely a perverse belief. Falsely they profess Buddhism. But since it is the religion of the teachers of the western Hú-people and others, and since its disciples are to be found among themselves, they shall not be judged criminals." In other words, the religion could be tolerated - as long as it was influential among the Western barbarians only and did not try to reach out to Chinese people. The fact that the government felt it necessary to issue this warning does point to a degree of missionary propagation. With the conversion of an Uygur khagan (khan) visiting China in the 760s, the Manichaeans received more clout in their dealings with China, due to the temporary alliance between the empire and the Uygurs. Manichaean clergy were used as representatives from the Uygur khagan to the Chinese emperor, and they were allowed seven temples in China proper, amongst them in the capitals Chang'an and Luoyang. But the alliance did not last. With the collapse of Uygur power after defeat at the hands of a Kirghiz army, the Chinese government decided to get rid of the Manichaeans. In the 840s, it waged a campaign against various Western religions; first Manichaeism in 843, then Buddhism, Nestorian Christianity and Zoroastrianism in 845. The official Manichaean temples were closed, and Manichaean priests were shaved and dressed as Buddhist shamans before they were executed. The remaining clergy was either exiled to Uygur Territory, or fled to other parts of China. A certain priest named Hulu in the sources escaped the persecution, and found a safe haven - and especially fruitful missionary soil - in the southern coastal province of Fujian and its neighbours. It seems likely that he would have fled to a part of the country were he could already expect to find some support, but the presence of Manichaeans here before his arrival is undocumented. Certainly the religion flourished along the Southern coast in the subsequent centuries. However, rumblings among Chinese officials and Buddhist writers were often heard. Instances of violence were blamed on Manichaeans especially from the early 12th century onwards, as in the case of the Fang La-rebellion in the 1120-21. In the medieval period Manichaeans were often labelled "vegetarian devil-worshippers", a designation that was later extended to Buddhist sectarian or lay groups that government officials deemed troublesome. The Manichaeans attempted to adapt themselves to more indigenous Chinese religious traditions, and seem to have drawn many supporters who thought of the religion as a kind of Taoism. Seeking legitimacy, one of their writings was for a time accepted into the Taoist scriptural kanon. Despite these attempts, harsh laws were put into place against the group, and they were often suspected of formenting unrest. Yet there was also a high level of co-existance, especially in such cosmopolitan centres as Quanzhou. A curious, though little understood, connection existed at the official level between the Manichaeans and the recently arrived Nestorian Christians of Quanzhou. After the fall of the comparatively religious pluralistic Yuan dynasty in 1368, Manichaeism began to face more active hostility from the Ming-emperors. A major persecution broke out at the beginning of their reign. The Chinese name for Manichaeism was ming-chiao, "Light sect", and the newly proclaimed emperor Zhu Yuanzhang did not like the Association of the sect with his dynasty. The sect was forbidden on penalty of death in 1370, along with a few other "dangerous sects" such as the lay White Lotus-movement. This renewed persecution will certainly have contributed to the religion's disappearance. But there were, as we shall see, still Manichaeans around at the turn of the 17th century.